The best backpacking sleeping pads can make all the difference during a long hiking or camping trip! They not only provide extra comfort and support while you sleep – they can also retain precious body heat to keep you warm on chilly nights! You can get all of this without adding any extra weight or bulk to your backpack, too! Before we get into our product reviews, here are a few things to look for in a new backpack sleeping pad. Material: Most sleeping pads are typically made of nylon, polyester, or foam. Each one has its benefits, with nylon being quiet and smooth on the skin, polyester being extra durable, and foam being great at retaining extra heat in chilly temperatures! Unrolled Size: Sleeping pads can vary in size, so we noted the inflated size. That way, you can find one that fits your sleeping bag, tent, or hammock. It’s also good to know so you can find one to suit your height! Waterproof: A waterproof sleeping pad is great for taking with you anywhere – especially if you think you might get caught out in the rain or have to camp out on muddy terrain! It will keep you dry and warm all night! Inflating: An inflating backpacking sleeping pad is great for campers who need a lightweight, compact surface that doesn’t take up space in their bag. Non-inflatable pads fold up quickly, and you don’t have to worry about them popping or losing air. Stored Size: We noted how small each pad is when rolled or folded up. That way, you can accurately plan how much you can fit into your bag. Many of them roll up to the size of a water bottle or umbrella! Warranty: A solid warranty is a good sign that you’re buying a quality product! Each sleeping pad is built to last, but if something happens, you can feel good knowing that the company will do their best to make things right. Now that you know what you need, let’s find the best backpacking sleeping pad for you! We found 10 sleeping pads to suit every need and budget. Whether you need a compact pad for long trips or a cushy one to add to your hammock at home, we have one for you! If you don’t have time to read about all 10 today, that’s fine – start with our Top Pick and Budget Pick, then come back later to read more! First up is our Top Pick, which was our favorite for the best lightweight backpacking sleeping bag! 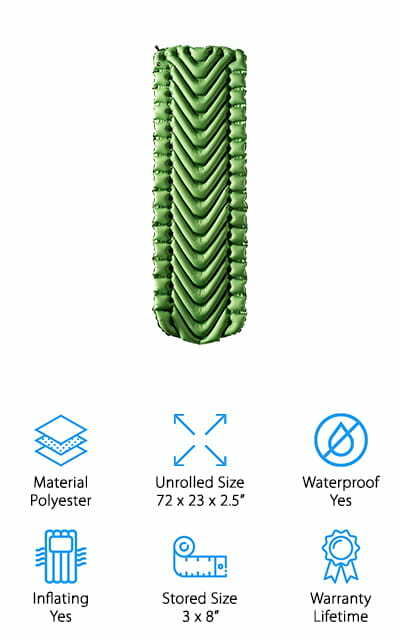 This inflatable sleeping pad only weighs 18.1 oz., and it rolls up into a tiny 3x8-inch bag, which is about the same size as a water bottle! You can easily toss this into your hiking backpack without adding extra bulk or weight to your pack. The v-shaped design allows you to sleep comfortably without rolling off the pad, and it helps disperse air so you don’t sink to the floor while you move around during the night. We like that this sleeping pad inflates in 10-15 breaths, so you can set up and get comfortable quickly. 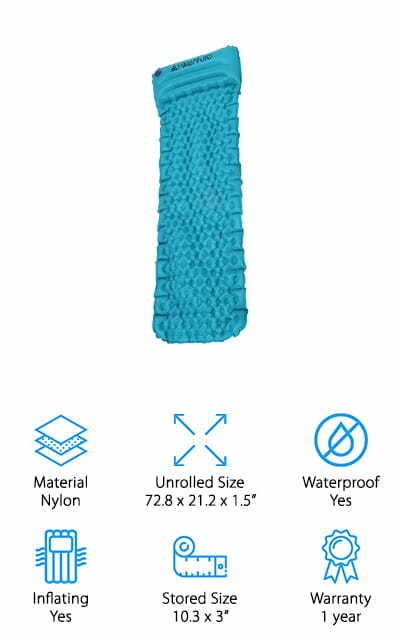 The durable polyester fabric is waterproof, abrasion and tear-resistant, and has an antimicrobial coating to protect you from bacteria or fungus while traveling. It also comes with a carrying bag, patch kit, and lifetime warranty, which is great because it means that Klymit stands by their product! If you’re looking for the best sleeping bag pad for a beginner on a budget, consider grabbing our Budget Pick from TNH Outdoors! This pad is not only inexpensive, it’s also super comfortable! It’s a self-inflating polyester and foam pad, so all you have to do is open the valve and it does the work for you! To add extra support, just blow in a few deep breaths and you’ll have a firm pad to add to your sleeping bag, or just lie down and get some shut-eye! We like that the pad is 1.5 inches thick, which will keep you comfy and supported all night long! 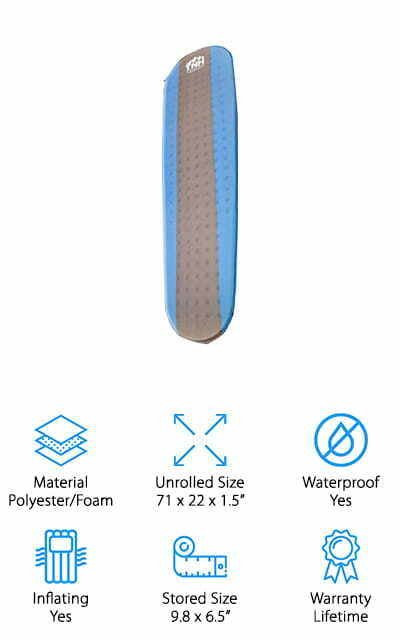 The pad is also waterproof and tear-resistant, so you can feel confident that your pad will last through years of camping! We also like that TNH Outdoors is committed to reducing waste by making their packaging biodegradable! This would make a great gift idea for a new camper or hiker in your family! Next up is another favorite of ours for the best lightweight sleeping pad from Outdoorsman Lab! This inflatable pad weighs only 16 oz. and rolls up into an 8x3.5 inch bag, so you can slip it into your bag or slide into an extra water bottle holder on your backpack! It inflates in 10-15 deep breaths and deflates just as quickly, so you don’t waste any precious time setting up or breaking down your campsite each day. We like that the pad is thick and comfortable to sleep on in any position, so you can a good night’s sleep no matter how you lay! It also does well to lock in warmth, which is a must on chilly nights! 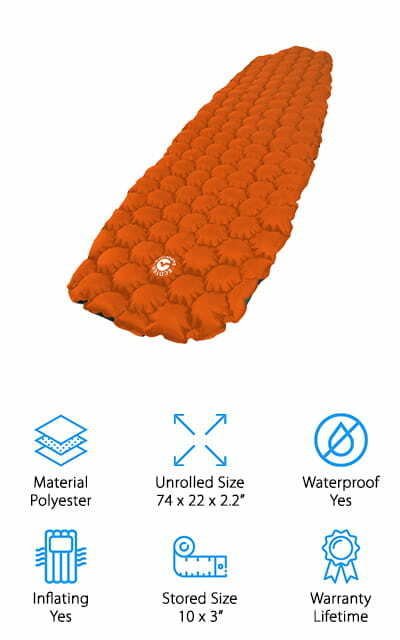 Outdoorsman Lab also sells sleeping bags that work perfectly with their inflatable pads, or just set one up by itself on a warm night! We think this is the best sleeping pad for side sleepers, back sleepers, and everyone in between! Looking for the best sleeping pads for backpacking in cold weather? Consider grabbing a foam sleeping pad from Therm-A-Rest! This backpacking sleeping pad is made of dense foam, which holds in heat overnight to keep you warm. Since this pad doesn’t need to be inflated or deflated, it’s quick to set up and tear down – just fold it up accordion-style and go! It folds down fairly small, so you can fit it in your camping duffel bag or hiking backpack for long trips. We also love that this pad is versatile! You can use this pad on its own, or you can toss it under an inflatable pad for added support and heat retention in really cold weather. Keep it rolled up and use it as a pillow or seat! It even makes a nice padded yoga mat if you want to do some light poses or stretching in the morning before you head out on another day of hiking! 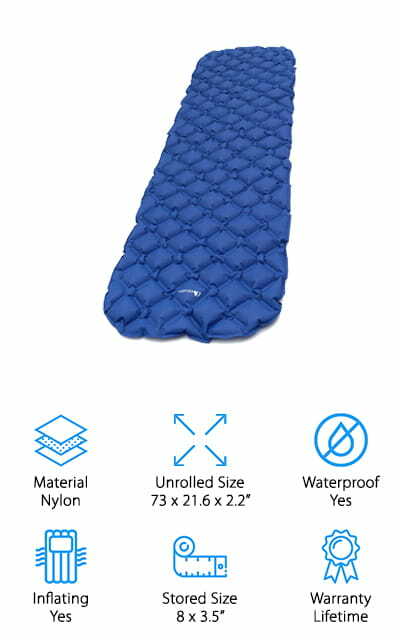 For a truly cushy night’s sleep, this camping sleeping pad from Chillax has everything you need to stay comfortable all night long! This pad is lightweight, compact, inexpensive, and easy to set up. You only need 4-5 breaths to inflate, and deflating is super quick, thanks to a special valve just for deflation! Once inflated, this pad is u-shaped to keep you snug in your sleeping bag or hammock without falling out or slipping around. It’s also made of a quiet nylon fabric, so you don’t have to worry about you or your friends making crunching noises while everyone is trying to sleep! The 2.5-inch thickness is great for insulating you from the cold ground, and the air is dispersed evenly to prevent you from sinking into the ground – even if you’re a side sleeper! We think this is a great investment to add to your camping or hiking gear! Get a luxurious sleep each night without breaking your budget! 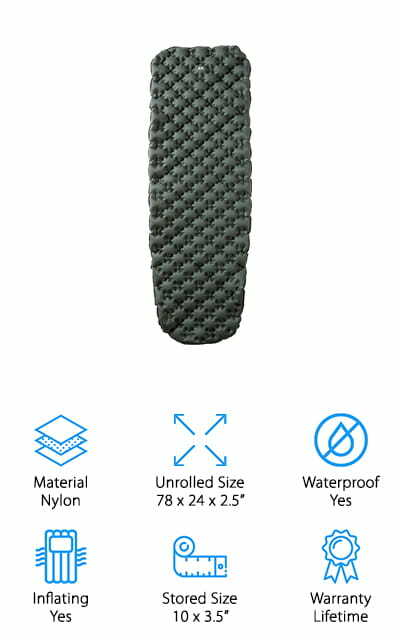 When looking for the best sleeping pad to put in a sleeping bag or hammock, we came across this flexible and cushiony pad from EcoTek! We liked this sleeping pad because it’s flexible, so you can use it a number of ways. You can place it under or inside your sleeping bag for extra warmth and cushioning. It also works really well in a hammock to provide extra comfort and support overnight! You can even use it as padding for a camping chair! It inflates in 10-15 breaths, and deflates quickly so you can get back on the trail early the next morning. We also like that EcoTek is partnered with the National Forest Foundation, and each sleeping pad sold will fund planting a tree in one or our U.S. National Parks! You can get a good night’s sleep knowing your purchase is helping keep the forests you love to hike, camp, and backpack through thriving for years to come! Want the best camping sleeping pad, but could also use a pillow too? No worries! This self-inflating pad from IFORREST has what you need to get a great night of sleep without adding bulk to your kit! The foam sleeping pad is self-inflating, so all you have to do is open the inflation valve and let it do the work. You can always add a couple breaths for added support if needed. The pillow and side rests are inflatable, so you can choose whether to inflate them on your own, or leave them deflated if you don’t need them. We like that this sleeping pad has the best of both worlds – a foam pad for extra heat retention, and inflatable padding for support! It also deflates easily as you roll it back up, and it will easily fit in your backpack without taking up much room. We think this is great for campers who want a serious amount of support! Next up is another great sleeping pad to take on your next backpacking trip! 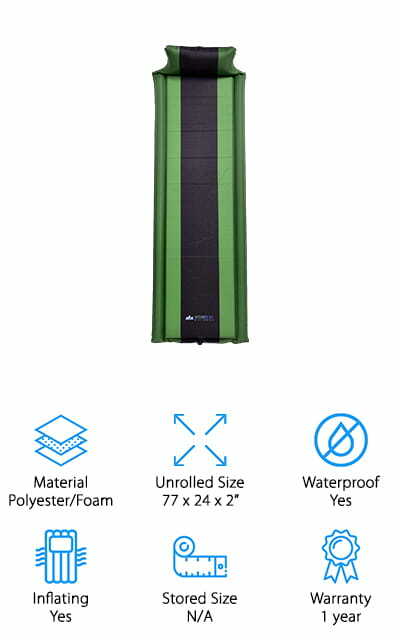 This inflatable pad is waterproof, tear-resistant, and easy to set up or tear down in a hurry. The two-way, double-decked air valve makes sure no air leaks out while you’re inflating it or sleeping. When you want to deflate it the next morning, just open the deflating valve to empty quickly and get back on the road or trail! We also like that it’s lightweight, weighing just under a pound, and it’s also compact enough to fit into your water bottle holder on your backpack! You can get a comfortable night’s sleep, thanks to the cube shaped air-support cells that keep the pad inflated, no matter what position you sleep in. This is another versatile pad that works well on its own, inside a sleeping bag, laid out in the back of your SUV, or tucked into your hammock for extra padding, heat retention, and support! 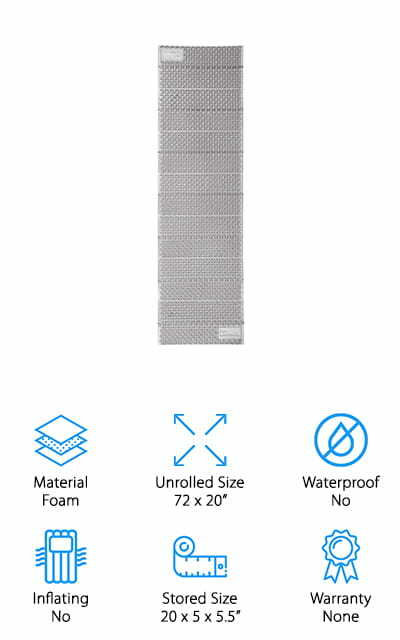 If you’re looking for a solid sleeping pad that is best for warm weather, this non-insulated pad from Hikenture is a great option! Because it’s not insulated, it won’t hold in extra heat while you sleep, and you can stay nice and cool. The waterproof nylon is soft and comfortable, fitting easily into a sleeping bag, tent, hammock, cot, or just use on its own! It only takes 7-12 breaths to inflate it, and it deflates fast too! We like that the egg-tray pattern is comfortable, and it has a pillow end for some added head support. No need to bring a pillow too! Another feature we like is the inflation tube by the headrest, so you can add extra air if you want to without having to get out of your cozy bed! 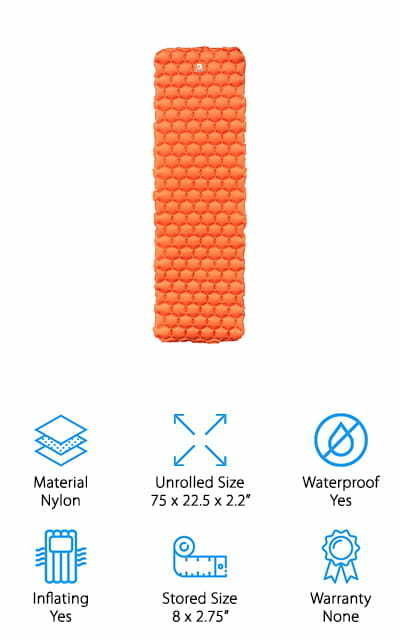 We think this simple and durable sleeping pad would make a great gift for the minimalist camper who wants comfort without adding bulk to their gear! Last up in our sleeping pad reviews is this set of both a sleeping pad and pillow from BIVARO. If you prefer to have a separate pillow while you sleep, but can’t justify bringing one along, this is great because it comes with both! Both the pad and pillow are inflatable, giving you tons of extra comfort without adding extra bulk to your hiking gear. Both of them together only weigh 17.8 oz., and they roll up to a tiny 8-2.75”, which is about the size of a water bottle or compact umbrella! We like that everything is durable and waterproof, and both are easy to inflate and deflate quickly. It also comes with a free e-book with tips and tricks to help you make the most of your camping and hiking adventures! If you want a sleeping pad and pillow combo that’s both inexpensive and compact, we highly recommend giving this set a try on your next outdoor adventure!